A new decoder " dav1d " based on the new video codec "AV1" that is up to 20% higher in performance than H.265 / HEVC was announced. Copyrights are set in the source code, but it is released under the BSD license , and it is royalty free with zero usage fee. Published davi 1 d is a nonprofit organization, VideoLAN , a developer of a classic video player VLC media player . 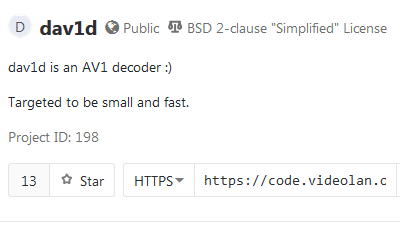 Dav1d created on the basis of the video codec "AV 1" which was announced in March 2018 by the nonprofit organization " Alliance for Open Media " with names such as Google, Facebook, Apple, Mozilla, Netflix, Amazon, Microsoft etc. , The development was carried out with the following points as the goal. The source code size of davi1d at the time of release is one tenth of the number of lines compared with libaom, and it is one third that of binary size, so it can be seen that it is a lightweight codec . Also, the memory capacity to use is one quarter of libaom, also here is lightweight. According to circumstances, davi 1 d shows the same speed as libaom 1.0.0, but it is slower than libaom HEAD. However, this situation may change if future development progresses. The name "davi 1 d" is a coined word taken from " D av1 d is an AV 1 D ecoder", but it is complicated and strange that the abbreviation "dav 1 d" is included in the official name not to be omitted To things. 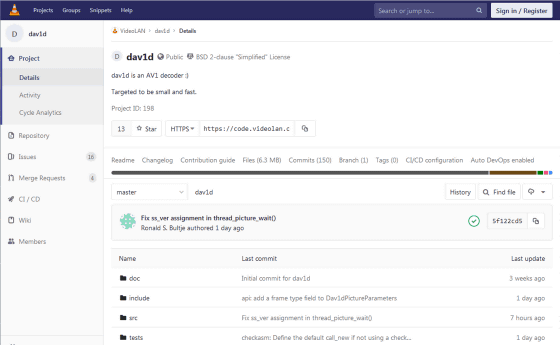 As for this, the provider also commented "It knows without being told that it is a recursive acronym ... ...."
The source code of dav1d can be obtained from the following GitLab repository. You can also view the presentation at davi 1d presentation in the YouTube movie below. What is "HTML5" recommended in 2010 different from "HTML 4"?